Landstroms creates the finest gold, gold on silver and diamond earrings available, each in a variety of styles for everyone, and for every occasion! 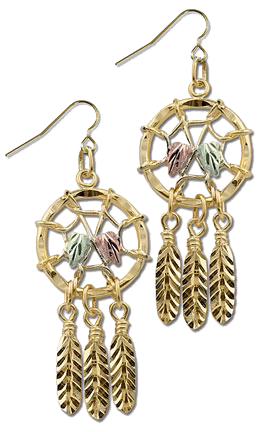 Crafted from sterling silver with 12 karat gold leaves, Landstrom's Dreamcatcher earrings are simply the most attractive you'll find anywhere. And Landstrom's variety matches their quality with heart, cross, hummingbird earrings and more - many are available with birthstones and Swarovski crystals. And don't forget, most Landstroms dangle-style ear-wear is also available in the form of ear ring jackets. Please call or email for prices. You'll be hooked once you try Landstrom's classic danglers!